Spend an evening at a Traveling Beer Garden! This August, the seasonal watering hole has made its way to Juneau Park. Stop in and enjoy Sprecher pints, Milwaukee food, local musicians, and the great outdoors at these traveling brew pubs. 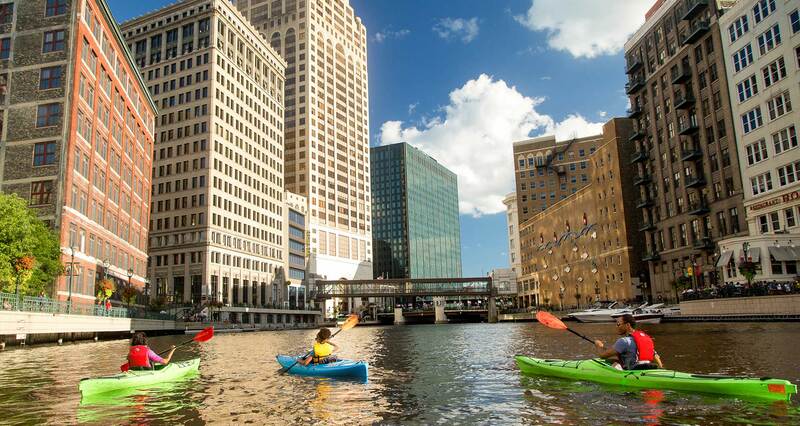 See MKE from the water on a Kayak tour through the heart of the city. Ride solo, or rent a tandem, while stopping at all your favorite waterside pubs along the way. Not in the mood for a self-guided trip? Sign up for one of Milwaukee Kayak Company’s guided tours. Paddle on, Brew City! Brats, baseball, and beer – oh my! The Milwaukee Brewers are great, but an old fashioned MKE tailgate is even better. Pack your grill, stock your cooler, and head to Miller Park for this unique Milwaukee experience. Be sure to save room for ballpark peanuts! Spend a day watching the waves at Bradford Beach. Whether you enjoy beach volleyball, surfing, or a good book in the sand, Bradford Beach has a little something for everyone. Craving a seaside snack? Northpoint Custard, located right next door, is home to some of the best burgers in town. Shop until you drop at an MKE Farmer’s Market. Enjoy a cup of local coffee, shop organic produce, wade through tents of handmade soaps, essential oils, and jewelry, or take home a handpicked bouquet of fresh flowers. You never know what you’ll stumble across at these little, local markets!